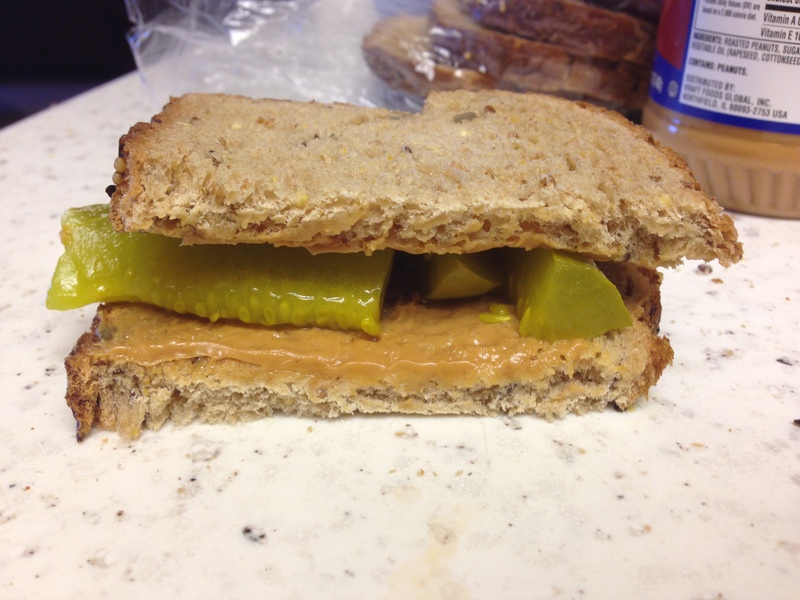 In a Pickle: Classic Dill or Spicy Garlic? Wash mason jars with hot soapy water or disinfect by putting them through the dishwasher or boiling water bath prior to canning for shelf storage. (you don’t need to do this if you plan on keeping the in the refrigerator. 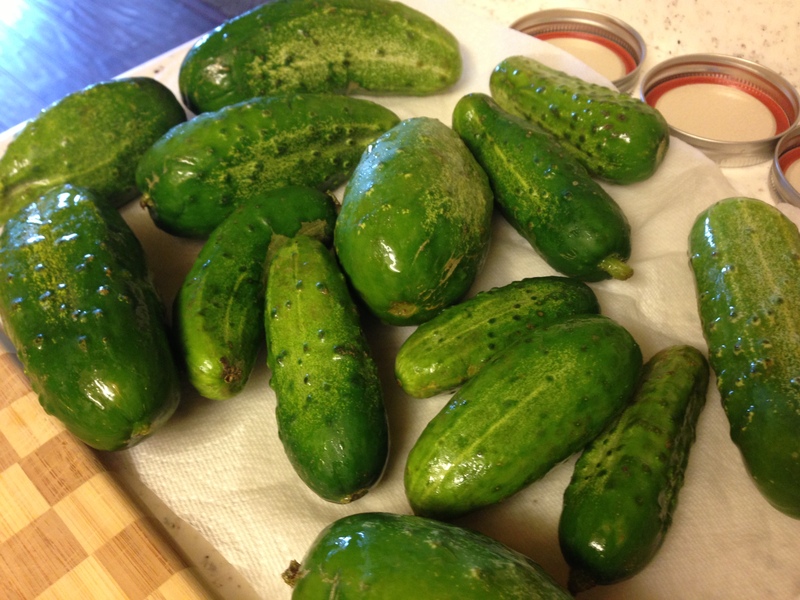 Wash and dry cucumbers. Cut off ends and depending on your preference, cut into chips, spears or leave whole. 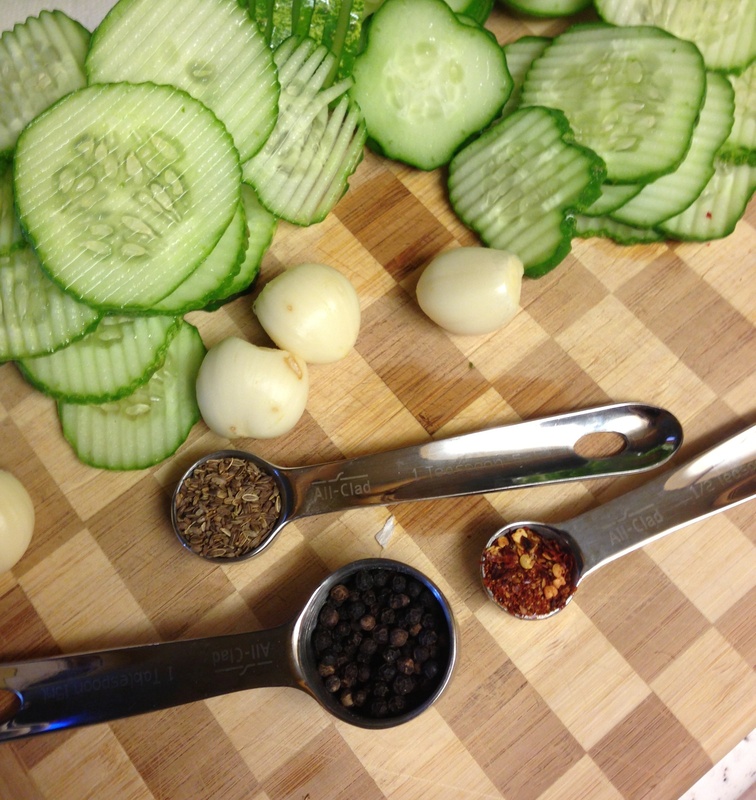 I used my mandolin with the ruffle edge blade to cut my cumbers into ruffled chips! Combine vinegar, water and salt in a sauce pan and bring to a boil. 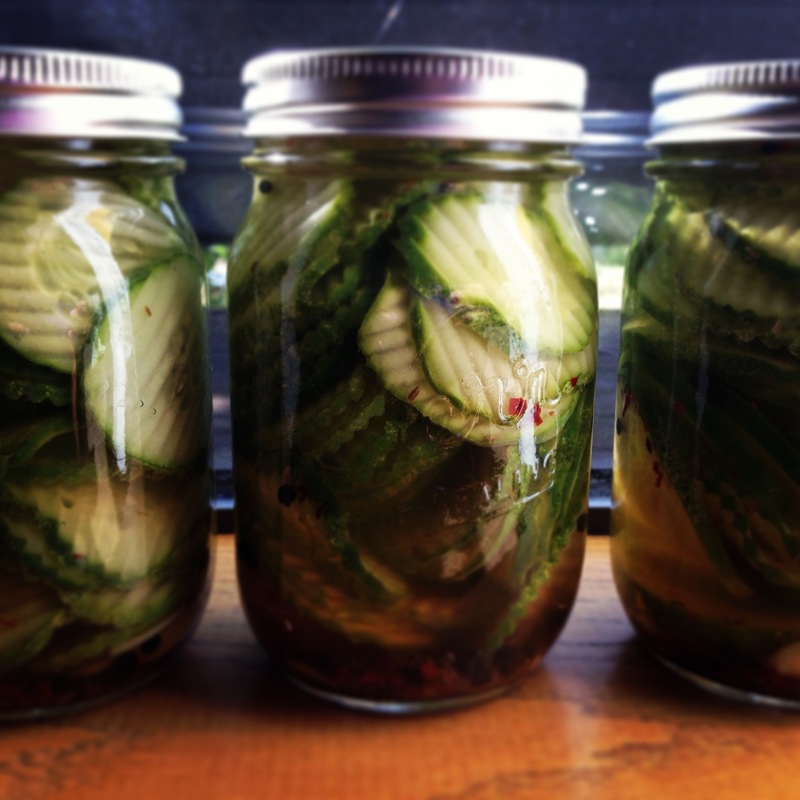 (If you don’t have pickling salt be sure to use Kosher sea salt- table salt does not work for pickling). 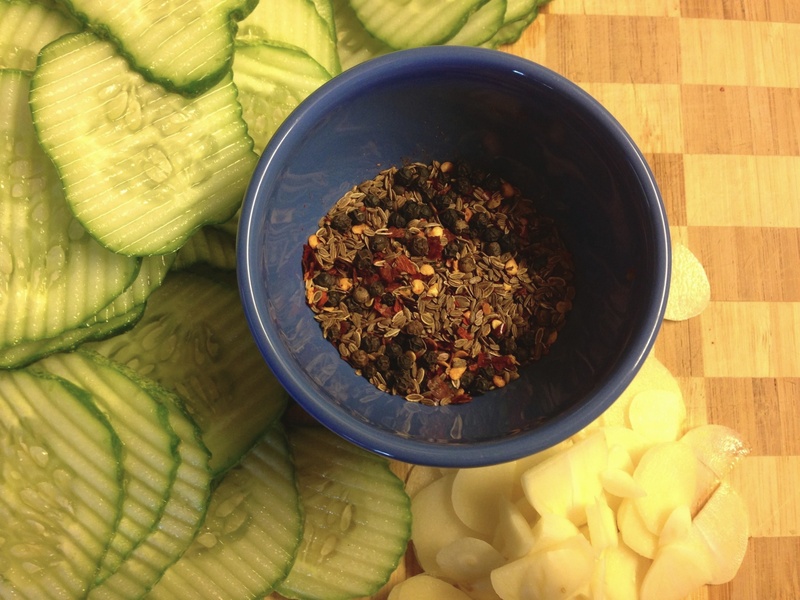 Combine dill seeds, pepper corns and chili flakes together in a bowl. Divide mixture and garlic equally among the 4 mason jars. 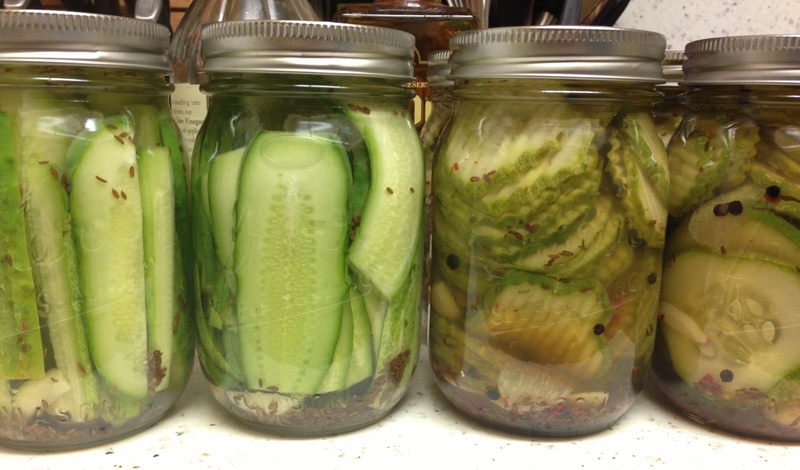 Pack cut cumbers as tightly as you can into the jars without crushing them. Pour brine into the jars leaving 1/4″ of room at the top of the jar. Remove any air bubbles by tapping the side of the jars. Wipe the rims of the jars and apply lids and bands. If processing jars for shelf stability, lower jars into your processing pot. When water returns to a boil, set a timer for 10 minutes. When time is up, remove jars from canning pot and allow them to cool. When jars are cool enough to handle, check seals. If you choose not to process your jars, let them cool before putting them into the refrigerator. Do note that your jars may seal during the cooling process. However, without the boiling water bath process, that doesn’t mean they’re shelf stable. Still refrigerate. Use the same processes as above to clean mason jars. Combine vinegar, water and salt in sauce pan, bringing to a boil. Divide dill, garlic and pickles equally between the 4 jars. Follow steps 5-8 above. This entry was posted in Recipes, Sides and tagged dill, easy pickles, homemade pickles, pickles, spicy garlic dill pickles by skibootsinthekitchen. Bookmark the permalink.